This booklet is an introductory guide to help individuals who have recently lost a limb below the knee in their recovery. 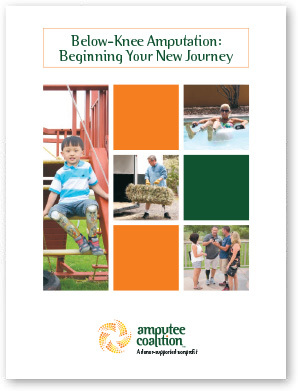 The booklet offers an overview of the following topics: Rehabilitation, Choosing and working with a prosthetist, Insurance coverage and reimbursement, Prosthetic and assistive device options, Home and vehicle modifications, and more. It is designed to complement the Coalition’s Your New Journey folder.